One of the great advantages of KRAH MISR pipes is that it is easily adaptable to all different kinds of project requirements. KRAH MISR Design and development sector can support customers to study drainage and water projects and give suggestions for appropriate types of pipes to the requirments of each project and operating condetions in terms of pressure stiffness and types of profiles. 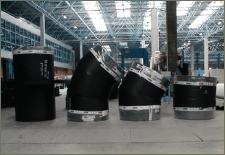 The main properties of th profile serie PR is the smooth inside and the profiled outside. The low weight and the high stiffness are significant. The fields of application for this kind of profiles are pipeline systems like for example sewer, drain, storm drain and ventilation. 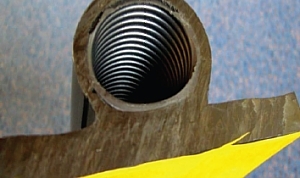 Profile type: SQ This profile pipe has a smooth inside and outside including internal profiles with one or more layers. This profile has a very high long-term stiffness therefore it is very suitable for extremely high loads and big diameters. Profile type: SP Should a standard profile not be sufficient due to the effects of all different kinds of loads, the Krah pipe system makes it possible to combine different kinds of profiles in order to achieve the required effects. For example a PR profile can be added to a SQ profile or a solid wall pipe without any problems. 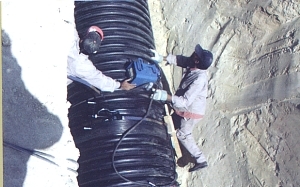 With this technique, the following two effects are achieved: Both profiles can be statically added whereby a stronger pipe is produced and a profile will be added to the otherwise smooth surface, which has advantages regarding the anchoring of the pipes in the soil preventing the axial deformation. Profile type: VW The type VW is a homogeneous solid pipe with smooth inside and outside surface. 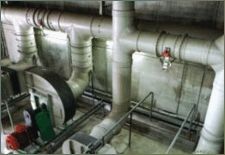 These pipes can be used for internal working pressure. The minimum wall thickness measures 5mm. Profile type: ST Pipes with the profile type ST are specially made for vertical tanks, where different wall thicknesses in one pipe are required to save material. The calculation method is according to DVS 2205. The KRAH MISR pipes can be providde in the complete range of diameters and stiffness classes but also fittings, manholes and other components are deliverable to accomplish the mission of a homogenous and reliable pipe system. All fittings are fabricated from pipes of the type VW or SQ. and designed corresponding to the required stiffnesses and in consideration of the welding factors. Every fitting can have any kind of pipe end and can be assembled with the existing pipe system with any jointing technique. All pipe end dimensions fulfill the requirements of the standard EN 14376, The standard spigot (Ls) and socket (Lm) length is 140mm. 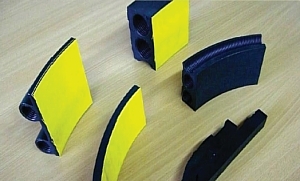 Bends Bends can be manufactured and segmented in different angles and the related radius of the bend to pipe diameter can be selected independently. Branches Branches can be manufactured and delivered in every type and form. The angle can be adapted individually from 15° to 90° as well as the ends and the respective segment lengths according to DIN 16961. Reductions Reductions can be made both centric and eccentric. For standard reductions the maximum difference in diameter is 200mm, other differences on request. House connections The house connection can be built onto the profile pipe at any place and in any weather. All usual dimentions for house connection lines are available. The standard diameters are DN/OD160mm and DN/OD 200mm, but other dimensions are possible. 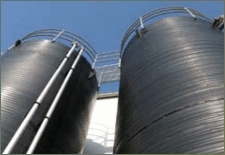 Following any other kind of pipe system as, for example, corrugated, clay and PVC pipes can be jointed. Puddle flange In order to lead KRAH MISR pipes through walls, e.g. 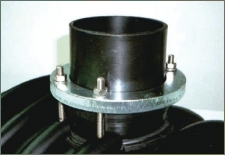 in sewage plants or concrete shafts, we recommend our puddle flanges which can be flush mounted in concrete. The tightness is secured by an anchor and a ring made of EPDM.